5.2 Earthquake hits northwest of the Kuril Islands. El Niño – NOAA dropped their odds of an El Niño event forming this winter from 67% in their October outlook to 58% in their November outlook, but a surge of warm water over the equatorial Eastern Pacific over the past week could signal the onset of El Niño. Italy – More flooding and landslides in northern Italy have claimed lives of at least three people. The torrential rain and flooding have affected Tuscany, Lombardy, Liguria and Emilia-Romagna regions. Extremely low levels of radioactive cesium from Japan’s 2011 Fukushima nuclear meltdown are present in ocean water offshore Northern California, researchers announced Monday. In seawater collected about 100 miles (161 kilometers) offshore of Eureka, the amount of cesium-134 was 2 Becquerels per cubic meter of water (a unit of measure based on the number of radioactive decay events per second per 260 gallons of water). That’s about 1,000 times lower than the drinking water limit set by the U.S. Environmental Protection Agency. This level of radioactivity does not represent a health hazard for people who want to fish or swim in the area, said Ken Buesseler, a marine chemist at the Woods Hole Oceanographic Institution in Massachusetts, who helped analyze the seawater. Buesseler is leading a crowdfunded citizen science program to track cesium levels from the meltdown by collecting water samples along the U.S. and Canadian West Coast. A swimmer who spent 6 hours every day for a year in water with 10 Becquerels per cubic meter of cesium-134 would still receive 1,000 times less radiation than the dose from a single dental X-ray, Buesseler said. “Now, we have measurements that confirm that for human health, when a mother from Santa Cruz calls me and asks if it’s safe for my son to go surfing, we have far fewer concerns,” he said. To date, no cesium-134 has been found at Canadian or U.S. beaches, including those in Hawaii, Alaska, Washington, Oregon and California. The short-lived isotope has only been detected offshore. Mali reported a second death from Ebola, four days after Doctors Without Borders said it appeared the country may have prevented the spread of the disease. A nurse died yesterday after treating a man in his 70s from Guinea at the Pasteur Clinic in Bamako, Sona Bari. Mali is now monitoring 28 people for possible exposure to the virus. Bagana (Bougainville Island, Papua New Guinea): Eruptive activity at the volcano continues. Several ash plumes were observed on satellite imagery during the past days, indicating continuing explosions. VAAC Darwin estimated the altitude of the ash plumes extending several tens of km to the south at 10,000 ft (3 km). Kilauea (Hawai’i): Today lava reached and burned an unoccupied home on private property near the transfer station on Apa`a Rd. Lava first flowed nearby on October 25, with the front approximately 50m/yds wide and 75m/yds away from the residence. The main flow went by, and after stalling near Pahoa Village Rd has widened upslope and nearby the transfer station. 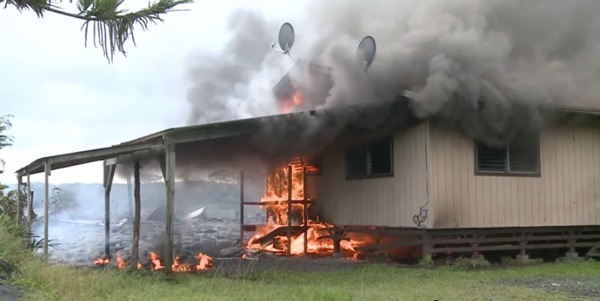 This is the first residence destroyed by lava from Pu`u `O`o since Jack’s Lava House in March 2012.